The random number generator winner is No. 3, Retiree3! And I am going to go nuts and declare Yankeegirl as a second winner because she went nuts and did four squirrelly cards. Sending your gift certificates shortly! Thanks to everyone for joining the challenge! 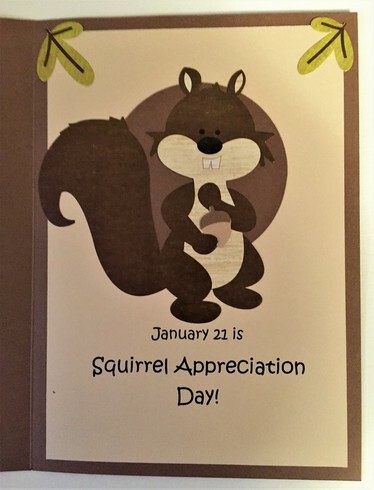 “It’s Squirrel Appreciation Day – Go Nuts!”, which easily becomes “It’s Your Birthday – Go Nuts!” Forgot someone’s birthday? 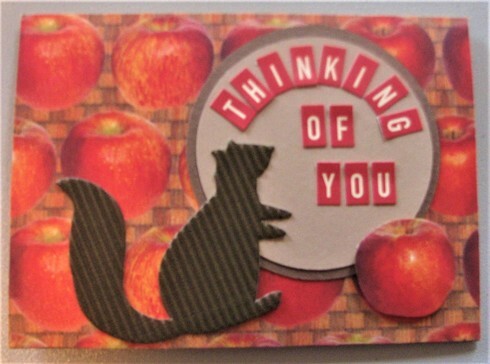 “Aw-w-w Nuts!” For Valentine’s Day, “I’m Nuts (Nutty) About You.” For a get-well card: “Hope you are feeling bright-eyed and bushy-tailed soon.” Squirrels also like to say Hello and I’m Thinking of You. 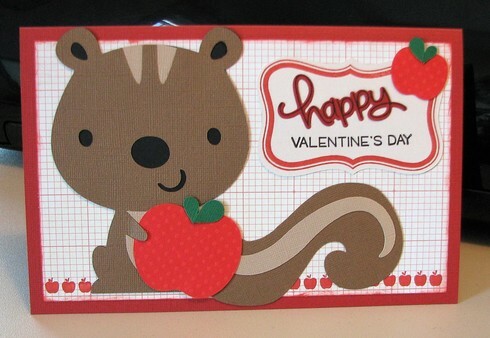 Squirrels often are shown holding acorns, but they also can hold a heart, gift, balloon, flower, or whatever else fits your card theme. 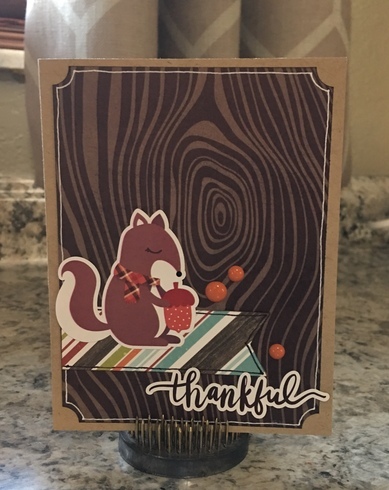 You may have squirrel stickers, die cuts or paper in your stash of fall theme products, or you can make your own die cut if you have a Cricut/Silhouette. 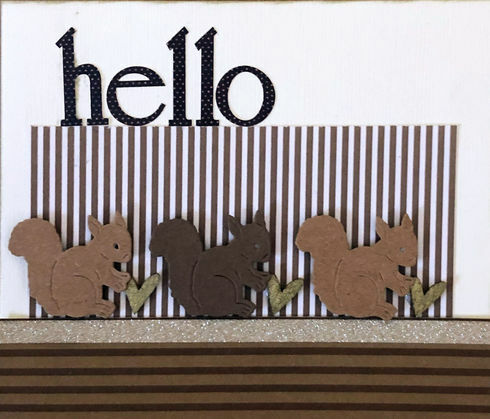 Free squirrel clip art also is available online; I found a cute one at clipartpanda.com. It downloaded quickly, and I was able to copy it into Word and then resize. I’d also be happy to mail some of these little guys to anyone who would like them (PM me your name and address). 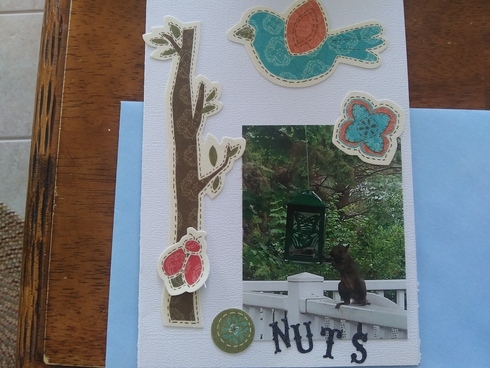 OPTION: If you just aren’t nuts about a squirrel card, I will offer the option to make a card featuring any other animal, but I hope to see lots of you get squirrelly! 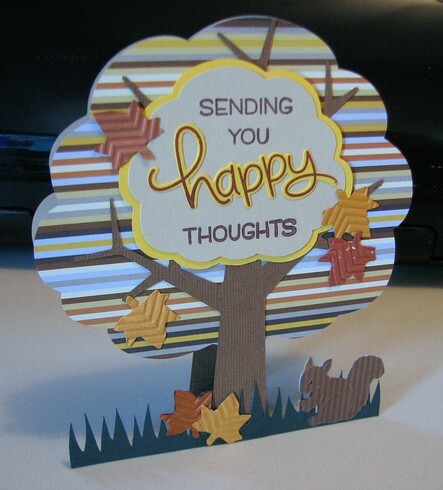 So the rules: Must be a new, paper card (no digi), featuring a squirrel (or other animal, option above). Post to this thread by 11:59 p.m. Jan. 31. You may go nuts and enter as many times as you want, and you may combine with one other challenge if it allows. A $5 ACOT gift card will go to one Cherry! 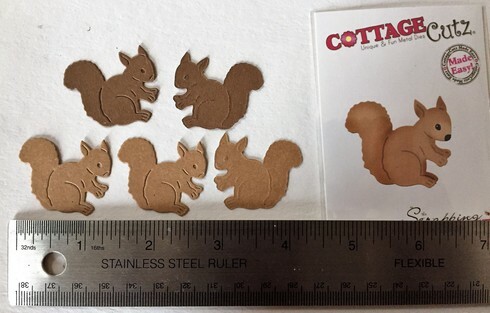 Please ask if you have any questions, and PM me if you would like some of the little Cottage Cutz die cuts. Last edited by wimom on Fri Feb 01, 2019 5:12 pm, edited 3 times in total. CUTE! I love the squirrels! I have tons of options to incorporate one as I pick up stamps, embellies, cut files, etc for when I scrap Penny chasing/staring at a squirrel. What a novel, creative challenge! I happen to love squirrels, and even have several around the house. I am sure I have a die or die cut somewhere, too.....or a stamp! Great page example for us! "Behind every successful woman is HERSELF." 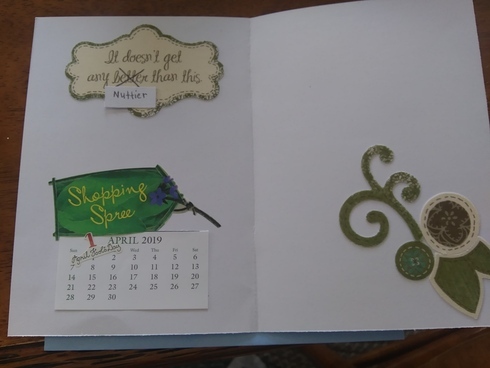 What a fun card challenge and your cards are awesome!!! Oh how cute! I love squirrels! We have a sweet one at our new house that we “inherited” from the previous owner- his name is Bobby! I am excited to do this one. I used to be indecisive; now I'm not sure. 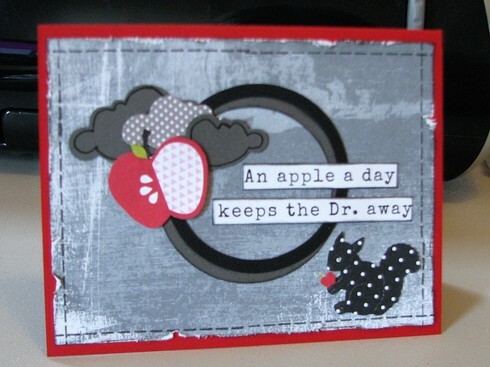 Since my wedding anniversary is on Jan 21, this is a perfect idea for a card for DH. I think he would even appreciate the humor. Here's one from me, thanks for the challenge! This line in the original post made me laugh . . . really hard. Really, really hard. 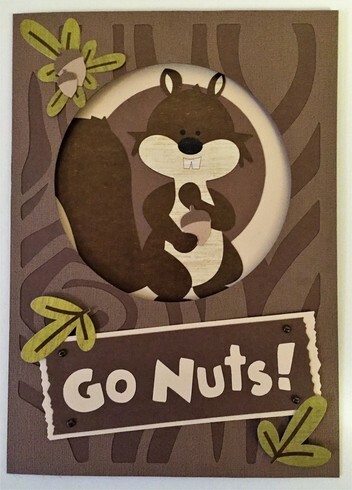 If you just aren’t nuts about a squirrel card . . .
Maybe I'm crazy. Maybe I just need carbs. You don't know. Glad you enjoyed my punny writing! Donna-Retiree3-Proud Grandmother of Three Boys! 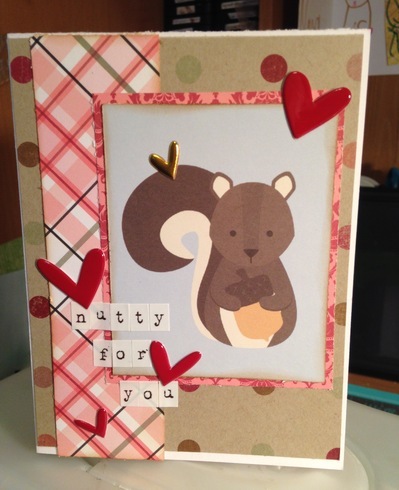 One little nutty card from me. A Valentine Day card for my youngest grandson! 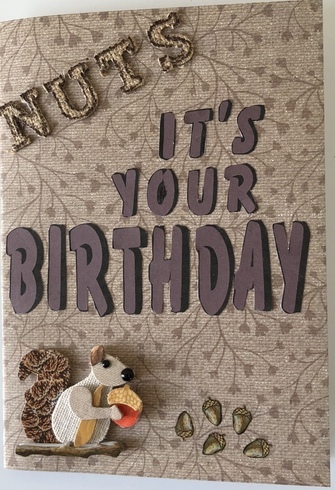 Birthday Card for my brother. 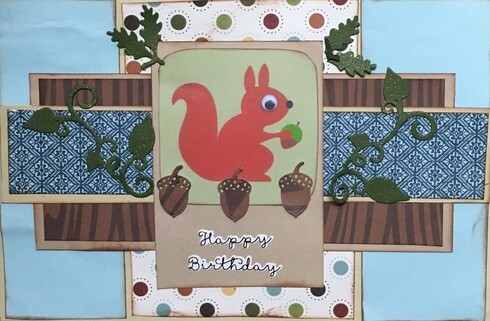 The squirrel, acorns and thickers are from my stash long ago. Haha! Happy to see someone else enjoys a little punny writing! Thanks for joining the challenge! Hey Charleneanne! Glad to see you had time to make a card and join the challenge. Hope life is settling down for you! You're welcome Tammey! And your card is adorable! How fast do you scrap? How much digital marketing is impacting today's businesses?